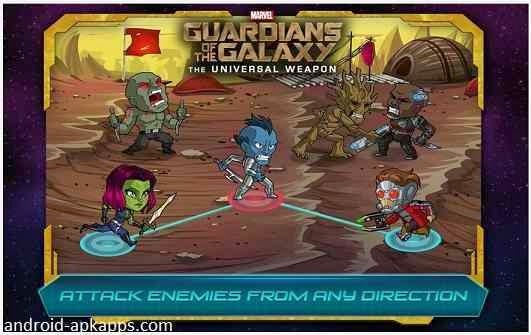 Join Star-Lord, Rocket, Groot, Gamora and Drax in an all-new adventure– Marvel’s Guardians of the Galaxy: The Universal Weapon! 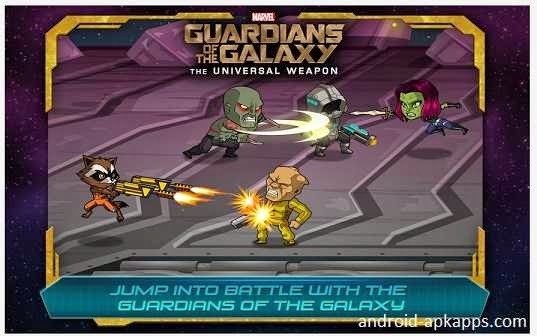 Jump into battle to help the Guardians recover the five pieces of The Universal Weapon before it falls into the hands of the villainous Ronan the Accuser!Meet the legendary outlaw Star-Lord and his rag-tag crew: Rocket, a gun-toting alien with a quick draw and an even quicker temper; Groot, the tree-like being who packs a punch; Gamora the deadly and enigmatic assassin; and the revenge-driven Drax the Destroyer. Command the Guardians and their allies in gesture-based real-time battles; recruit and upgrade additional heroes, and then unlock and unleash devastating special attacks! 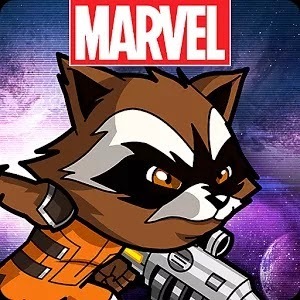 Game Features• No In-App Purchases and no Internet connection required to play!• Unlock, upgrade and control 25 characters from the Guardians of the Galaxy universe.• Travel the Galaxy and battle through more than 60 levels of real-time, gesture-based combat in Story Mode.• Story and Arena Modes! 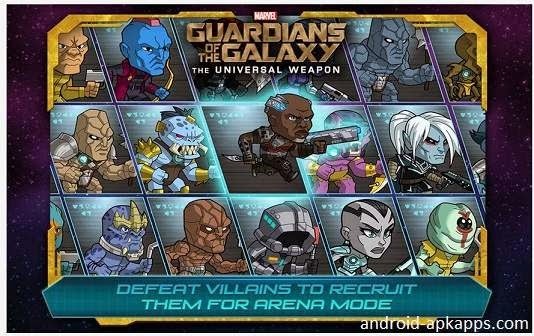 Progress through the story and defeat villains in Story Mode then switch up your GOTG team and recruit additional heroes and villains for survival in Arena Mode.• Customize your team with the Guardians and their Allies. Recruit heroes, level up their skills, and then outfit them for battle using unique item buffs and the mysterious Iso-8.• Unlock combo moves and unleash crushing attacks from powerful pairs like Rocket and Groot or Drax and Gamora!• Go head to head with a roster of Guardian of the Galaxy villains like Korath, Nebula, and Ronan!• Download now and play in your choice of English, Chinese, French, German, Italian, Japanese, Korean, Portuguese, Russian, or Spanish• Korean is not supported on any device that has a Qualcomm Snapdragon CPU• Connect with Google Play Game Services or Facebook to compare high scores and earn achievements.